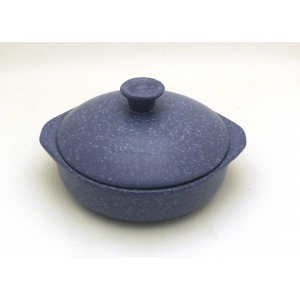 Cooking Gres consists only of natural materials and doesn't contains metal type, lead, nickel, cadmium, avoiding any kind of food contamination. The ceramic of Cooking Gres, cooked to 1200 °, ensures resistance to scratches, shocks and thermal shocks, making it practical and usable on any type of heat source, flame, glass ceramic and induction hob. All Cooking Gres products have a high capacity to absorb heat "softly" then release it, just as slowly absorbed, to food. The heat is distributed evenly and this aspect don't alter the chemical composition of foods and their nutritional properties, thus keeping intact the natural flavor of foods and ensuring a healthy and tasty cuisine. Thanks to the enamel coating baked at high temperature, all Cooking Gres products can be washed in the dishwasher. Each product can easily be stacked, taking up little space.